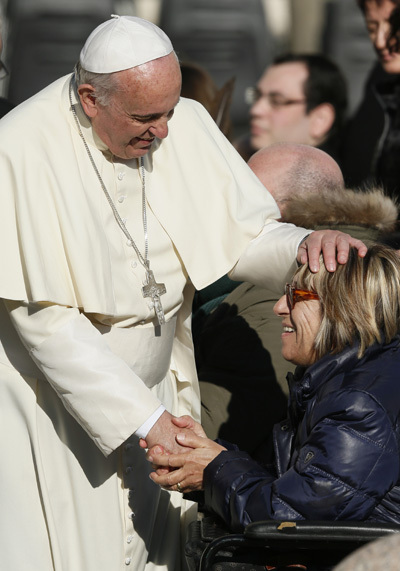 VATICAN CITY (CNS) — At his last weekly public audience of 2014, Pope Francis started a series of talks on the family with a reflection on the Holy Family of Jesus, Mary and St. Joseph as a model for all Christian families. 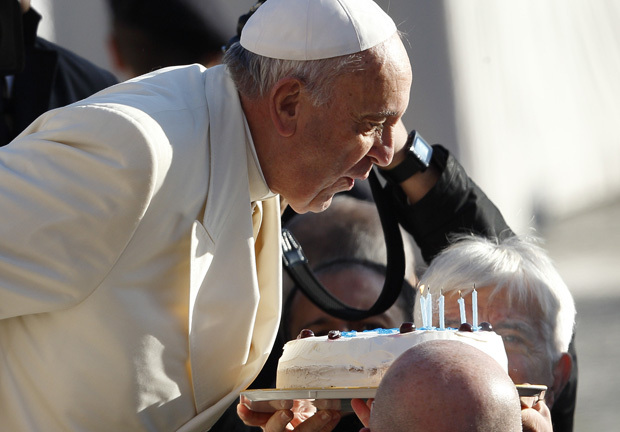 The pope spoke Dec. 17 after getting cheers, balloons and even a birthday cake as he arrived for the audience that coincided with his 78th birthday. He said his remarks were first of a series in preparation for the October 2015 Synod of Bishops on the family, which he described as the conclusion of a process begun at the October extraordinary synod on the same subject. “I have decided to reflect with you, in this year, on the very subject of the family, on this great gift that the Lord has given the world from the start, when he gave Adam and Eve the mission of multiplying and filling the earth,” the pope said. If the first installment of Pope Francis’ talks is indicative, they will be in his usual conversational and folksy style, in contrast to the philosophical meditations of St. John Paul. “It is not difficult to imagine how much moms could learn from Mary’s care for that son, and how much dads could benefit from the example of Joseph, a just man, who devoted his life to supporting and defending his child and wife, his family, in difficult periods. “Not to speak of how much the adolescent Jesus might encourage kids to understand the necessity and beauty of cultivating their deepest vocation, and of dreaming big dreams,” Pope Francis said.